Correction on the above: the WLC was doing photometry (recognise the surface materials because of the light they reflect), not imaging. 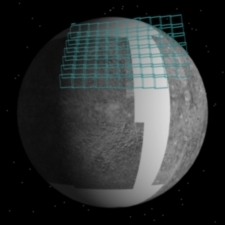 However, the NAC has started working, creating a panorama of a part of Mercury, including unexplored terrain. 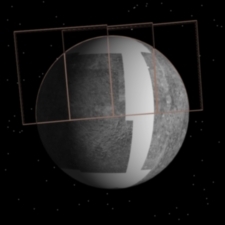 Right now, Messenger is photographing surfaces never imaged before. Another short photometry session by the WAC will be followed by the second NAC mosaic in the next few minutes. NAC imaging the North polar regions (also unexplored terrain) I'm quite certain either the terrain to the left or to the right of the strip wasn't imaged by Mariner 10, and is based on radar observations from Earth. 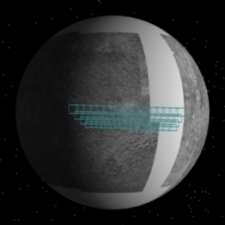 So, although it's 'a bit' explored, it hasn't been actually imaged that close. There is probably a lot of interest. Thanks to all posting here. While the primary use for this site is rocket launches, this kind of coverage is also appreciated very much. A pleasure! I should be studying right now, the exams are close, but integral equations have so little appeal compared to first-of-its-kind Solar System exploration... :)NAC observations more than halfway completed, after that will be a WAC departure color imaging session. The resolution of the NAC images ranges from 115 and 300 meters for the last inteval, which is quite decent indeed! Coming up on the WAC departure color mosaic. WAC working hard now. There's one hour's worth of observation left in this flyby, including 4 NAC departure mosaics and a short session of WAC mosaic imaging in between. After the last NAC session is performed, and for the next several hours, MESSENGER will take a (expectedly very cool) departure movie, until tomorrow's evening. I answer myself to my previous question: I wondered why the team hadn't planned any observations during eclipse, but they actually had (only the timeline didn't reflect it), according to the planned events sequence posted in the Planetary Society's site. They did laser altimeter measurements. Also, the section to the left of the uncharted territory (the light band in the visualization) is the one imaged from Arecibo, by radar, but not by Mariner. 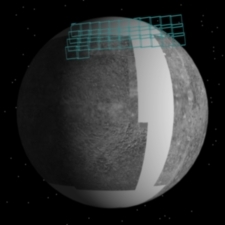 FWIW, long-dead Mariner 10 is believed to be in a solar orbit that brings it close to Mercury every few (probably six) months. Planetary scientists are going to have a field day presenting the images. As an amatuer astronomer--I cannot wait! There's an approach movie posted in MESSENGER's site now (although it's only a composition of the images already posted, as far as I can see...) and, most important of all, a quite big image (though not extremely hig-res) of Mercury's uncharted territories! 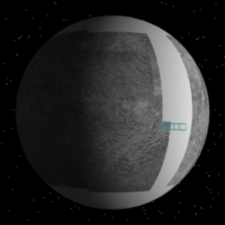 they do a great comparison of the Mercury pic and a Moon pic at the Planetary Society blog. Well worth a read! !